These products can provide fresh and healthy water for your pets drinking needs that can last for several days without a refill. 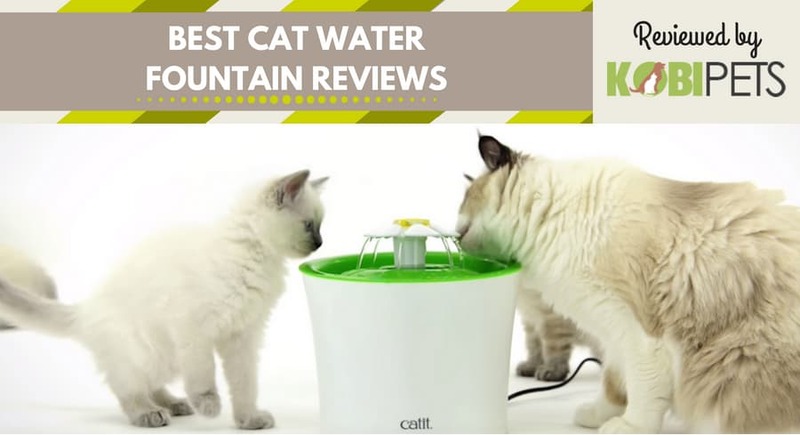 Here is our collection of the cat fountain reviews that will help you find all the information about these products and make the best choice. Do not waste your time, make your decision by taking a look through our pros and cons of each product. Catit flower fountain is an uncommon designed fountain that will make your cat want to drink more water. It includes recirculating pump and 2-stage filtration that keeps water clean and fresh longer. The flower forms the fountain top, and it is suitable for your cat’s sensitive whiskers. It is situated at acomfortable height for adult cats and kittens. With the 3 extra flow settings, this fountain is great for multiple pet household, because it forms several free-falling streams of water for your cats to drink at the same time. 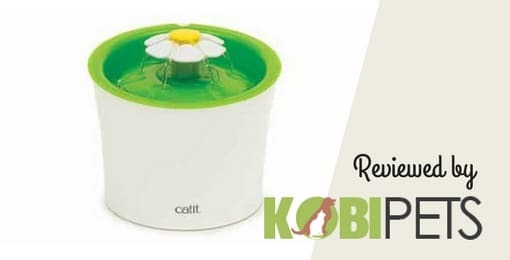 Its design also means that your cat can only drink it as it flows, and depending on your pet, this could be an advantage or a disadvantage. A fountain includes a dual-action water softening filter and a small energy-efficient pump. This special, replaceable filter softens and purifies hard water, while also retaining debris, stray hairs and sediment. The flower on the top can be removed, which will turn the fountain style into a bubbler style. Large 3-liter reservoir takes up a small space. One of the flaws is that it’s made of plastic, and the pieces are not attached the best way to the top, so depends on how playful your cat is, it can move it without many struggle. With a PetSafe Freedom pet door, you will give your little furry friend more freedom than ever. Give him more access in and outdoors. It is also very easy to install. Without cutting, insert it into your sliding glass door, and it will automatically adjust to it. The Replendish waterer is very convenient for the busy pet owners. How does it work? It provides a continuous flow of clean and fresh water. It has the Microban antimicrobial protection that helps prevent the growth of odor-causing bacteria and stain that cause mold and mildew. It contains an advanced filtration system that removes and reduces the existence of numerous volatile organic chemicals and chlorine. With this replaceable filter, purity and cleanliness are maintained. 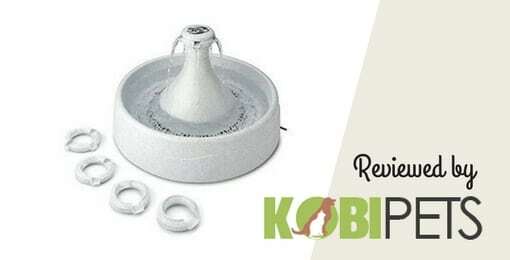 Combined with its large-capacity gravity flow designed, it provides a constant supply of clear and fresh water for your cats. It stays fresher and cleaner for a longer period. It is made of plastic, so you need to make sure to clean it regularly. That way the presence of bacteria will be avoided. The cats like it and drink more from it than they would from a bowl. You can purchase this product with smaller and bigger gallons and in different colors, pearl blue, pearl lady pink, pearl peacock blue and pearl white. Also, there are some weaknesses here, for example, it is not that easy to clean and it is a bit difficult to line up the bottle just right in the receiver part. This is an automatic water dispenser with a filter built in it. The great thing about this product is that it doesn’t need to be connected to a water line, so you can put it anywhere in your house. The unit is made with durable plastic of 168 ounce liquid capacity. It cannot be moved easily, meaning that there is no risk of spilling water all over the place. Free-falling stream continuously circulate and aerate the water with healthful oxygen that encourage your cats to drink more water than they normally do. It includes a replaceable charcoal filter which removes odors and bad tastes, keeping it clean and fresh and your pets hydrated. With BPA Free plastic design you can safely wash it in the dishwasher. If the motor is too loud, make sure the liquid level is above the minimum line. It is not silent, but is not annoyingly noisy at all. It’s especially good because it holds a good amount of liquid, so it works well for multi-cat household. It’s easy to set up and looks nice. Cleaning the pump and filter is very important and it’s enough to do it every 2 weeks. Also it is highly recommended to replace the filter every 2-4 weeks. Its design flaw is that sometimes the pump gets clogged and it leaks out. This unique fountain makes the drinking more appealing and fun for your pet, so it will encourage your cat to drink more than usual. The Drinkwell 360 fountain comes with the five interchangeable spouts that connect to the top part of the fountain. It allows you to provide up to five free-falling streams of water and helps your cat drink from any angle. It is Ideal for multiple pet households. 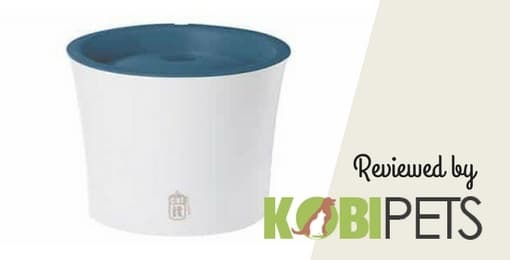 It contains submersible pump and replaceable charcoal filter that eliminates the odor and bad taste to keep your pets water clean and tasting fresh. It also has a pre-filter that prevents cat hair to get into the pump. The filter should be changed every several weeks or more, if you have more than one cat. For the entire unit it’s recommended cleaning at least once a week, including the pump. Make sure to disassemble the unit to properly clean it. It has rubber bottom to keep the fountain from sliding. The fountain runs on a low voltage, submersible pump for safe and quiet operation. You can adjust the flow by turning the top. Receiving ramp reduces noises of falling drops and splash. The thing we didn’t like is how easily the pump could be damaged. So, you need to take an extra care of that. This specially designed fountain provides healthy and fresh drink to your pet, with a grand design for a more comfortable drinking position. Its great water-to-air surface increases oxygenation for a better and fresher tasting. This uniquely designed fountain has a multi-stage filtration system with activated carbon that purifies water by absorbing impurities and filters out debris, food, hair and sediment. 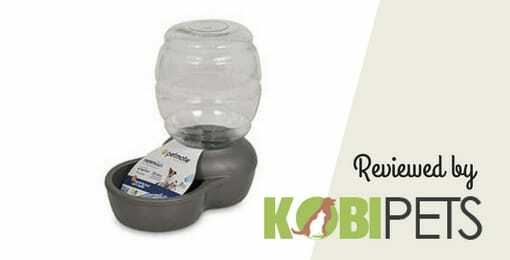 This fountains re-circulating flow, eliminates stale, and its movement appeal to your furry friend to satisfy his playful side. Catit fountain has one carbon/ion/foam transfer resin water softening filter. These different filters are very useful because ion transfer resin softens hard water by removing the calcium and magnesium, while active carbon removes chlorine odor and absorbs its impurities such as food, debris, and sediment. Its capacity holds 100 fluid ounce. It runs on a low voltage, consuming less than 4 watts, using less power than a night light. Because of its height, you will eliminate the spilling, especially when it’s filled, it is too heavy for your cat to move it around. The design of this fountain makes it pretty easy to take apart, clean, and reassemble. You need to consider that it is made of plastic, so it is highly recommended to clean it weekly. As a pet parent, you always make sure to give your beloved pet the best care possible. Cats need your attention and a few basics in life to keep them healthy. When it comes to their health, we often forget how important it is for our pets to be hydrated. One of the main benefits of a water dispenser is that it is encouraging your cat to hydrate more by using fresher and cleaner drink. Pet fountain with running water that is regularly filtered will provide your cat fresh water whenever it needs. The wild animals prefer running water because it is much cleaner than when it’s stagnant or still. This is why animals seek out for running water, especially cats. We often place a bowl of water for our pet and leave it until it needs to refill. But during this time, it can become stale and contaminated. As a result, they don’t drink enough of it. This can cause cats to suffer from a variety of medical diseases, such as urinary tract and kidney diseases. To stay hydrated, your pet needs a lot of clean water, especially if they are fed a dry cat food diet. Providing them running water with the pet fountain, will surely grab their attention, alluring them to use it. This will help your furry feeders who often need to be encouraged to drink an adequate amount. 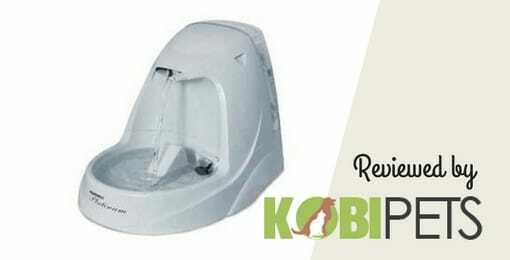 Busy pet owners will find choosing top quality water fountains for cats very important. And with the good reason. You will no longer waste your time refilling and cleaning the bowl every day. With its unique filters, it provides your cat fresh and healthy water. It also retains stray hairs, sediment, and debris. You can choose from several models. Some of them have a large reservoir that you can fill up with enough liquid to last throughout the day. Now you can leave your pet at home for a few hours with one less thing to stress about. If you thought that this fountain benefits only your pet you are mistaken. Because it adds humidity in your room, it keeps the air cleaner by increasing its quality. So it can be valuable to you and your pet. It is also great for multiple pet household. Especially when you are away from home, you can be sure that your pets will have enough drinking water. These water dispensers come with different sizes, so you can choose which is best for them. Pet fountains keep your cat healthy by ensuring that they stay hydrated all day. By using a pet fountain, your cat has access to clear and fresh water at all times to keep him healthy. This is very important in warm weather when hydration requirements are increased. In order to stay healthy and happy, our pets need fresh and safe water. Sometimes, because we are too busy, we overlook the most important thing to their health. But providing them pet fountains, you are encouraging them to hydrate more, keeping them healthy and energetic. It solves the problem by continuously filtering the water, making sure that their drink is not contaminated. Make sure to clean them regularly, especially if you are choosing the plastic designs. Also, if you are a busy pet owner, you will no longer have to worry about your cat having fresh water while you are away. If you want to know about our top picked cat litter boxes take a look at our review of the best products available on the market.